Wherever one finds themselves in Colorado on the 4th of July there’s a nearby celebration eager to welcome residents and travelers. Below is a list of 35 communities with planned events, by no means is this a complete list, there are many more. Be aware that fireworks may be cancelled in areas where the fire danger is extreme. Aspen – Old Fashioned 4th of July Celebration. Breckenridge – 4th of July Celebration, 10k trail run, hometown parade on Main Street, concerts at Riverwalk Center. Colorado Springs – Flyovers, games, food, music by the Air Force Academy Band and the Colorado Springs Philharmonic, fireworks at the Air Force Academy football stadium. Crested Butte – Pancake breakfast, fun and funky parade followed by a big water fight complete with fire truck, old-fashioned games, free patriotic concert, evening concert before the fireworks at the Crested Butte Mountain base area. Cripple Creek – Live entertainment, beer garden and fireworks. Dillon – 4th of July celebration at Town Park. Durango – Breakfast and 5k at Rotary Park, 6pm parade, street dance on Main Avenue and fireworks. Estes Park – Car show, cowboy sing-along, pancake breakfast, band concert and fireworks over Lake Estes. Fort Collins – Daytime downtown live music, beer garden, pie eating contest, fireworks in City Park. Georgetown – Parade, 5k race, BBQ, bucket brigade race. Watch the fireworks from the Fireworks Train high up on the Devil’s Gate bridge. Glenwood Springs – 4th of July Fanfare. Grand Junction – Parade, 4th of July on the Monument (Colorado National Monument), fireworks. Grand Lake – Lakefront fireworks at dusk. Highlands Ranch – Parade, run and celebration at Town Center, hot dog eating contest, fireman challenge, pet adoption fair, evening concert, fireworks. Idaho Springs – Fireworks display over Bridal Veil Falls and Tayler Water Wheel. Julesburg – Volunteer Fire Department fireworks display. Keystone – Fishing derby, BBQ, live music, bike parade through the village, Kidtopia KidsFest, fireworks. Lafayette – Late afternoon and evening events a Wanaka Lake Park, food concessions, beer garden, kids’ activities, concert, pie-eating contest, fireworks. 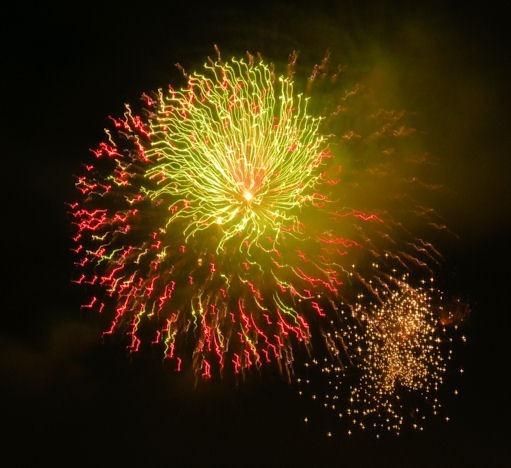 Lake City – Old Fashioned Fourth of July Celebration, family entertainment, parade, Air Force fly over, races in the town park, street dance music, fireworks. La Junta – Old Time Fourth of July Celebration at Bent’s Fort, fireworks at La Junta Rodeo Grounds. Louisville – Fireworks at the Coal Creek Golf Course, early evening kid activities, music by the Boulder Concert Band. Loveland – Day long in North Lake Park, food, games, music, flag raising, fife & drum corps, largest fireworks in Northern Colorado. Mancos – Potluck BBQ at the Bauer House, Fireworks at Boyle Park. 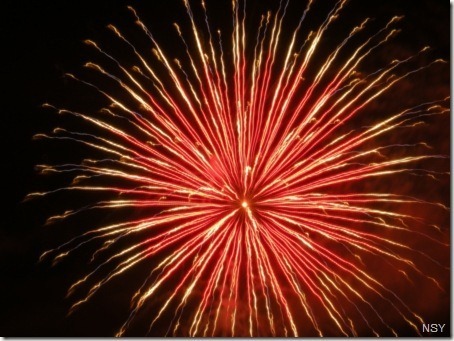 Montrose – All day event Cerise Park, fireworks. Northglenn – Food booths, concert and fireworks at E.B. Rains, Jr. Memorial Park. Ouray – Morning to night events starting with pancake breakfast, 10k run, parade, BBQ, water fight, kids games, music, fireworks. Pagosa Springs – Carnival, arts & crafts festival, parade, community picnic, live music, Red Ryder Roundup Rodeo and fireworks. Pueblo – Rollin’ on the Riverfront July 4 with the Pueblo Symphony. Redstone – Bike decorating party, pie sale, food concessions, Air National Guard fly over salute, parade, water games. Silver Plume – Ice cream social and baked goods in Dinger Park after the Georgetown BBQ. Steamboat Springs – Pancake breakfast, parade, Art on the Mountain, block party with hot dogs and Routt (Routt County) beer floats, pro rodeo, fireworks over Howelsen Hill – also, cross country/Nordic combined roller ski race and Independence Day ski jumping extravaganza. 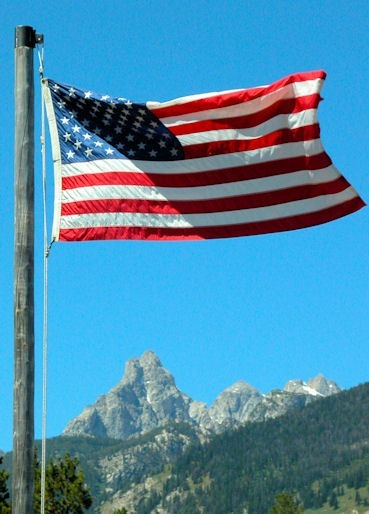 Telluride – Firemen’s Fourth of July Parade, community picnic, games, fireworks. Westcliffe – Parade, flea market, car and motorcycle show – fireworks have been canceled due to fire danger. Happy and Safe July 4th to all. Historic tours of Denver’s venerable Brown Palace Hotel focus on “Affairs of the Heart” during February. Oh, the tales Debra Faulkner, hotel historian and archivist, has to tell. After 118 years the “Brown” reveals stories of intrigue, romance, love triangles and even murder. Public tours are offered every Wednesday and Saturday at 3pm and last approximately 75 minutes. Tours cost $10/person, reservations are required. Children must be 10 years of age. 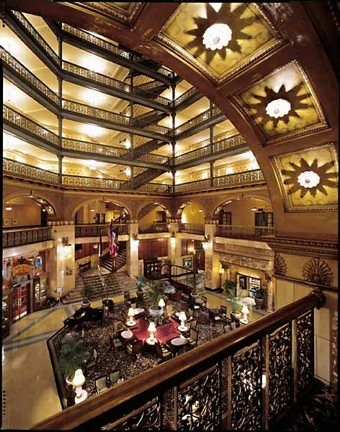 Besides “Affairs of the Heart” and general history tours, specialized themes include a presidential tour (Every U.S. president since Teddy Roosevelt in 1905, with the exception of Calvin Coolidge, has visited The Brown Palace. ), an architectural tour and the ever-popular ghost tour given in throughout October. Groups of 5 or more must make arrangements for a private tour. Private tours can be arranged for those requiring a time outside of the normal scheduled tours. I suggest making reservations for Afternoon Tea before your tour. Served in the eight-story atrium lobby the traditional afternoon ritual includes tea sandwiches, scones with Devonshire cream shipped directly from England and tea pastries. All accompanied by a harpist or pianist. If your valentine is a chocoholic the Chocolate Decadence Tea is sure to be loved – and, you for the idea. You may have recycled the tree, put away the presents, and eaten the leftovers but have you dealt with the dreaded fruitcake from Aunt Mabel? If not, this is your opportunity. 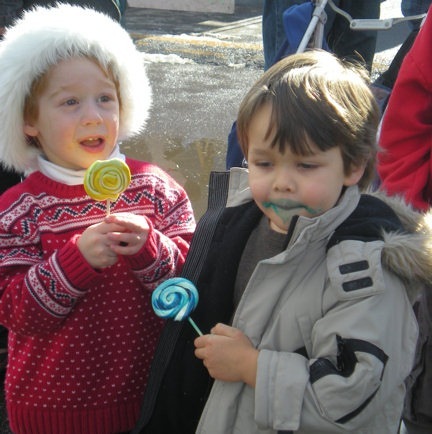 Head to Manitou Springs, January 9th and have fun disposing of the fruity, nutty "treat." Tucked between Pikes Peak and the Garden of the Gods, Manitou is immediately west of Colorado Springs. The visitor’s bureau calls the town "magical", I call it quirky. You’ll find characters and class – and, a whole lot of panache. This is a town that knows how to have fun and take a lighthearted look at life. How better to cap off the holiday festivities that to join in the hurling and launching at the 15th Annual Great Fruitcake Toss? Competitors and spectators will gather at the Manitou Springs High School Track for a final holiday “send off”. Bring your own cake in one-, two-, or four-pound sizes or "rent" one for $1.00. Fruitcakes must contain glaceed fruits, nuts and flour – they cannot contain anything inedible. Don’t wrap in foil, duct tape, etc., all fruitcakes must be visible to the "Fruitcake Toss Tech Inspectors." Events start with the Kids Toss – three age groupings, boy and girl winners, and the Fruitcake Toss – one person physically throwing a 1 pound cake. Then, they get down to the serious stuff: the Fruitcake Launch using a mechanical device and the Pneumatic Spud Gun or canon division using pneumatic devices brought to the competition by the contestant. It doesn’t stop there, they also have the team “Catch the Fruitcake” competition, and Accuracy with targets place on the field of "battle". The entertained crowd gets to vote for the Most Creative Launch and the Best Showmanship. Teams are asked to "dress" for the event. Bob almost wept the first time he saw all the flying fruitcakes crushing to earth. This is a man who never saw a fruitcake he didn’t like. Imagine how happy the squirrels are to clean up after the event. After the competitions we "squirrel" away for a delicious healthy lunch at Adams Mountain Cafe. When You Go: The Great Fruitcake Toss runs from 10am – 2pm, Saturday, January 9, 2010 with registration beginning at 9am. Entry Fee is one canned food item or one non-perishable food item to be donated to the local food bank. Along with thousands of others we stopped by Hammonds Candy Factory for the 9th annual Candy Cane Festival today. After a week of extremely cold temps, grey skies and snow everyone was ready to bask in the pleasantly warm sunny day, visit with Santa and stock up on holiday sweets. Families waited patiently for tours of the factory to see candymakers at work. Lines also formed for rides on ‘Lil Spike’ the motorized train and hay rides drawn by a handsome team of draft horses. Entertainment, story time, face painting and inspecting emergency vehicles kept visitors busy. Of course, there was a full array of Hammond candies for sale. 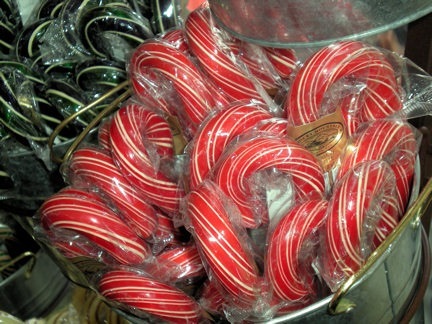 Buckets of the hand-formed candy canes in a rainbow of colors and flavors, baskets of old-fashioned ribbon candy, giant lollipops and peppermint pillows tempted shoppers. Bags of candy coal reminded us of those who were more naughty than nice this year. Although the 2009 Candy Cane Festival is over one can always stop by the factory for a free tour or visit the retail store Monday – Saturday. View the slide show for more photos of the 2009 Candy Cane Festival. A sweet time was had by all. Each December Hammond’s Candies in Denver hosts the Candy Cane Festival – Dec. 12, 2009, 9am-5pm. Take a tour, finish off your Christmas shopping, whisper your list to Santa, feed his reindeer or enjoy the variety of activities. Caroling, storytelling, gingerbread cookie decorating, carnival games, face painting and trolley rides keep everyone entertained. The delight of a child- toddler to teen – Santa’s lap is sure to boost your holiday spirits. After your visit to Hammond’s I bet you won’t be able to wait till Christmas for your first sweet treat. Hammond’s is located at 5735 N. Washington Street, Denver, Colorado. Candy store open Monday-Friday 9am-4:30pm and Saturday 10am4pm. Directions and online shopping available on their website. I’m adding a new feature on Where To Go – Travel USA. Throughout the summer I plan to post a few special events, festivals or happenings around the state of Colorado for the upcoming weekend. Memorial Day Weekend kicks off with events all around the state – art, sports, outdoor recreation, history and beer gain attention this weekend. Get out and have some fun. Blues, Brews and BBQ – Beaver Creek, May 23 & 24. Blues concerts, platters of barbecue, culinary demonstrations and Colorado microbrewery beer tasting, noon to 5pm daily. BolderBOULDER – Boulder, May 25. Thousands race 10k through the streets of Boulder finishing in Folsom Field Stadium, first wave of runners 7am. Paddlefest 2009 and BV Pro Rodeo – Buena Vista, May 22-24. Whitewater boating season kicks off with educational activities, demonstrations, and pro kayaker competitions, everything from yoga for paddlers to movie premieres. Territorial Days – Old Colorado City (Colorado Springs), May 23-25. Street festival with 200 craft, commercial and food booths in the first territorial capital of Colorado. 2009 marks the sesquicentennial (150 years) of Old Colorado City. Grand Olde West Days – Craig, May 23-25. Antique tractor pulls to cowboy disco dance at locations throughout Moffat County. Taste of Creede – Creede, May 23&24. Arts festival and fine arts auction, which includes Silver Chef cooking competition. Downtown Denver Arts Festival – Denver, May 22-25. Over 125 of Colorado’s best artists exhibit fine art and fine craft at Denver Pavilions. Old South Gaylord Memorial Day Weekend Festival – Denver, May 23-25. “World Class Music”, kids area with rides, activities and magic shows, food and craft booths at the 30th annual event, 9am-6pm daily. Iron Horse Bicycle Classic – Durango, May 23-25. Have bike, will peddle – criteriums, circuit races, road races, tours, BMX races trials dual slaloms, team trail ride, mountain bike races, kids races. Art Market – Estes Park, May 23-25. Colorado and national artists fill 90 booths in this annual juried showcase, plus food and music. Clear Creek Railroad and Mining Days – Georgetown, May 23&24. Narrow gauge and model trains, mine tours, burro races, rafting, storytelling and fiddle races. Indian Arts and Culture Festival – Mesa Verde Country®, May 22-31. Native American juried art markets, cultural programs, traditional dances, drama, tours and music. Held in multiple sites – Cortez, Dolores, Mancos, Towaoc and Mesa Verde National Park. Yampa River Festival – Steamboat Springs, May 22-25. River events from raft races, tube and freestyle rodeos to pro races, fun for spectators and participants. Mountainfilm Festival – Telluride, May 22-25. Dozens of films screened, symposium, gallery walk, ice cream social and more. Food is the 2009 theme.